Studio located in an old building, completely recycled. First floor by elevator. Ceiling with double height. Slash pine floors, original wood openings. Stylish details. On the ground floor, living room, desk, fully equipped kitchen and bathroom with Jacuzzi. Upstairs, bedroom with a balcony. Shared terrace and solarium. O apartamento é bem localizado e muito bonito. Graciela e Luìs foram òtimos anfitrões e nos atenderam sempre prontamente. Em relação ao custo, localização e os equipamentos é ideal para um casal ficar bem acomodado. Muy bueno.Recomendable por su ubicación y Confort. Muy lindo y cómodo departamento y hermosa terraza! Excelente opción para quedarse en Buenos Aires. La mejor, sin duda, por precio, instalaciones, seguridad, ubicación. Este apartamento tiene mucho lindo detalhes, es nuevo y es perfecto para una pareja. La ubicacion es interessante, cerca del casco histórico de San Telmo, la única nota negativa es que abajo hay un restaurante y se escuchan charlas y ruídas a vezes a la noche tarde. muy acogedora. nos sentimos como en casa! Muy buen trato. Departamento en excelente estado con buena ubicación. Great apartment, very comfortable, great people to do business with, everything is simple and the location is terrific! Ótimo apartamento, bem localizado em área central, afastado na medida certa da bagunça das proximidades da rua Florida. A internet falhou um pouco mas os donos foram atenciosos a tentarem resolver o problema. Eu recomendo! Hola Casa San Telmo staff. I would like to say that I had a very enjoyable experience and stay in our home away from home. My partner and I after 4 weeks found the apartment about right in every aspect for our purpose. We are keen dancers of tango and as such found the apartment to be well located within walking distance of many tango venues in and around San Telmo , Montserrat and the Microcentro. We found the apartment to be reasonably priced, comfortable clean and quiet so that we could sleep in a little after a late night of tango. I would have no hesitation in recommending this apartment to other couples that might want a ideally located place close to many tango venues and as a base to explore the greater city of Buenos Aires. The staff from Casa San Telmo are very pleasant people who will ensure that every thing will be in order for you however long you intend to stay. In our view it really was very well located and we highly recommend it to any other keen tango dancers that want that BA experience. Great place, very clean. Exactly what we needed, but noisy when it rains. Central location of the apartment, very quiet, supermarkets and restaurants around, owner speaks english and was very helpful. Lovely apartment, good location. Louis was very helpful, we enjoyed our stay very much. Thanks! My appartment was very nice, it was of European standard. Normally it was very quiet and protected of sun. Safe, comfortable place in an interesting and charismatic quarter of town. Great and helpful service from the rentals team; and at a moderate price. Highly recommendable. This apartment was clean, and comfortable. Everything works well (even the jets in the bathtub!) It lacks the old charm of some of the more character suites, but was the perfect place the relax and get sorted before our flight home. I would not hesitate to stay here again, or recommend it to friends when in Buenos Aires. Gracias! Cumplió con nuestras expectativas, la atención de la agencia y los dueños fue muy buena. Gracias. Very clean and very nice appartement. Location is idealistic because far from big boulevards and noises, but close to transports and to many shops (just around the corner => ideal for breakfast and meals purchasing). Don't forget to enjoy the terrasse, a very nice way to meet other traveling people. We stayed a week here and loved it. It was a pleasure to come home every night, take the romantic old elevator up to the first floor, open up the door and really feel at home. This place feels like the apartment you always wanted to have, with its twenty foot high ceilings . 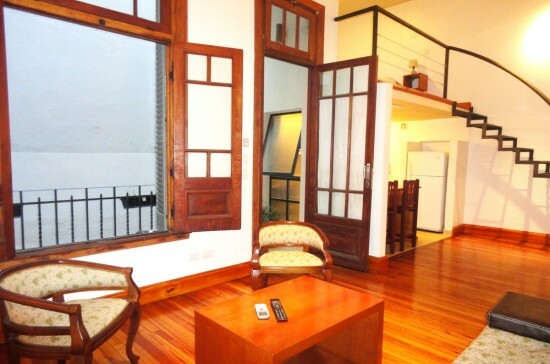 The location is nice, just outside of the antique heart of San Telmo. Cozy place to stay in buenos aires for a reasonable price, Graciela was very kind and helpfull. There is a market close to the flat helpfull if you want to buy food for breakfast and take home. Nice furniture, the place was tidy and clean. Would definitely come back.